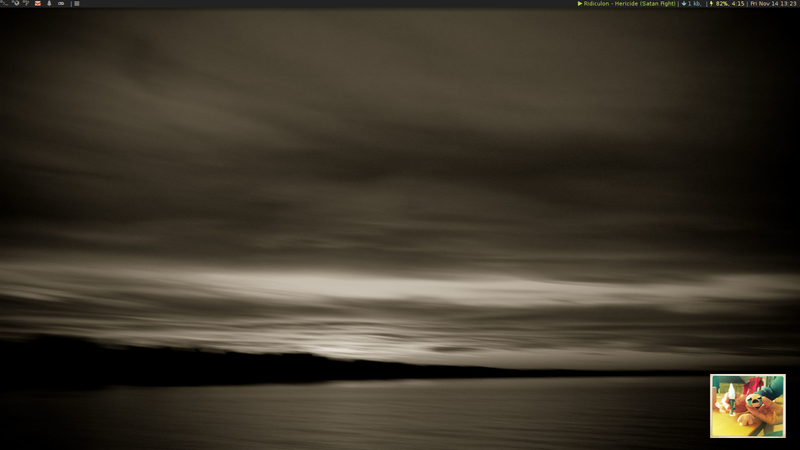 4 Hugues Ross - Blog: My desktop: Wait, what?! Around Halloween time, I had a "Brilliant" idea to deter people from borrowing my laptop. There is a single key on my keyboard that, when pressed, summons a skeleton as shown above. It was pretty easy to set up with my current desktop, but before we talk about that, I think it's best to give some background about my system. My current desktop. Click to view it in all of its glory! I switched to Arch Linux on my laptop last summer, since interesting things happened, and I haven't looked back since. I took this opportunity to learn how to use a tiling window manager, and I fell in love with suckless' dwm. The cool thing is that dwm is very small, and intended to have its code edited instead of using config files. So far, I've built up a wonderful collection of scripts designed to let me have some fun with it. My biggest script handles the information displayed in the upper right-hand corner. Most of it is fairly simple, relying on a ton of basic Linux tools, so I won't bother talking much about it here. If you're interested in any specific part of it, just send me a message or comment here and I'll happily explain. At some point the source will be available, but I'm not quite ready to share it. I drew a grinning skull using Krita, and my drawing tablet. I could've done a better job, but I really liked the sketchy look. I animated the skull opening and closing its mouth using Blender. I used to know Blender inside-out, but my coding has gotten in the way of using it. This seemed like a great opportunity to get back in the game. I found a bunch of spoooky sounds on Freesound.org. I put the whole thing together in Blender, and added the special effects. I rendered the result to be my exact screen resolution, 1600x900. I still have the files, so on later machines I can remake this. As you can see, it's really quite a simple process. This whole mini project took just an afternoon to do! Now, if you use dwm you might be wondering how I got a pretty little albumart box on my desktop, and a drop shadow for my top bar. In reality this is a bit of a hack--I just use ImageMagick! I've been working on an ImageMagick script that runs when a new song plays, when I start up, and when my background switches. Currently, it's slow, doesn't look great, and isn't finished yet, so I won't be sharing the script. However, expect a small post about it in the future! Just like with my bar script, I'm still willing to discuss the topic in greater detail if you want. So, what do you think? If you have any suggestions or requests for me to implement and explain, I'd love to hear them!